To most of us, pets are a part of the family. We shower our furry friends with love, companionship, and care. Unfortunately, not everyone shows the same devotion to their animals. In fact, some people neglect their pets or even abuse them, which can lead to aggression. And some animals will randomly act aggressive no matter the upbringing or training. California law provides recourse to victims of dangerous animal attacks. If you or a loved one has recently sustained a domestic animal bite or other injury from an animal in Los Angeles or Southern California, our attorneys at Panish Shea & Boyle, LLP can help. Here’s what you need to know about dog bite laws in CA. California is one of a handful of states that has a “strict liability rule” when it comes to canine bites. Also known as a dog bite statute, California Civil Code Section 3342 makes pet-owners legally responsible for injuries in most scenarios. Some states allow owners a pass when they didn’t know a pet was dangerous, which makes it more difficult to obtain compensation. California law, however, states that owners are responsible for the actions of their pets, even if they didn’t have reason to believe a pet was dangerous. There are exceptions to this rule, however. To collect compensation, victims must be able to say they were in a public place or were lawfully in the space where a dog or other animal bit them. In other words, owners cannot be strictly liable for the actions of their pets if someone was trespassing or committing a crime on their property. As with most personal injury claims in Los Angeles, there is a statute of limitations that applies. In the case of a dog bite, the claim must be filed within two years of the incident. In general, dog bite statutes in California work in a victim’s favor. For example, if a dog grabs someone but doesn’t break the skin, it can still count as a bite. Similarly, a victim may collect compensation under California dog bite statutes if a pet knocks someone over or causes injury in ways other than biting. In some cases, however, victims will have to prove a pet owner was negligent to collect compensation. Examples might include when a canine bites a bicycle wheel and causes a crash or when a dog runs out in front of a car and contributes to an accident. Injured parties may still be able to get compensation in this instance but only if they can prove their injuries resulted from the pet owners’ negligence. If the dog was not on a leash, for example, this may be grounds for a negligence claim. If you suffer a dog bite, you may face more than just a flesh wound. Saliva transfers rabies and allows it to make its way into your blood stream, and to the brain. Often, there are no obvious signs of rabies until several months later when it has already made it to the neurological system, at which point it is usually too late for treatment. If you’ve suffered a dog bite, you should wash the wound for at least five minutes using soap and water. You should also seek treatment from a doctor, who can determine if you need further treatment. If so, you will receive a series of anti-rabies shots that stimulate production of antibodies and protect against rabies infections. Animal control will also monitor the animal for signs of rabies. Ignoring the potential for rabies can be a costly medical mistake that can cause greater damages than a single dog bite wound. It is also important to seek medical help if you suffer scratches during the attack, in case the dog’s salvia contacts an open scratch wound. Your rabies treatments may be eligible for compensation. According to the Center for Disease Control (CDC), Roughly 4.7 million dog bites occur in the United States each year, and nearly 800,000 of them require medical care. Some of cases are so severe, that medical professionals administered over 28,000 surgeries for dog bites in 2015. The number of dog bites in California alone has been increasing over the past decade; emergency visits for dog bites grew from over 35,000 in 2010 to over 38,000 in 2015. Dog bites can incur heavy medical costs. Nationwide, liable dog owners were responsible for over $686 million in dog bite and dog-related injury costs during 2017. The average claim cost was a little over $37,000. Insurance companies pay over $1 billion for dog bites annually. Children are at a greater risk for injury through dog bites, and almost half of children under the age of twelve have suffered a dog bite at least once. Children make up 79% of fatal dog attacks, with 65% of bites occurring on the head or neck. What are the top 10 most dangerous breeds of dogs? From 2005 to 2017, pit bulls killed 284 Americans, about one citizen every 16.7 days, versus rottweilers, which killed every 105 days. Pit bulls and rottweilers contributed to 76% of the total recorded deaths. When mastiff-type guarding and war dogs are added, this group of dog breeds accounts for over 80% of all deaths. Analyzing the data suggests that there might be a breed-specific problem with human fatalities from dog attacks. 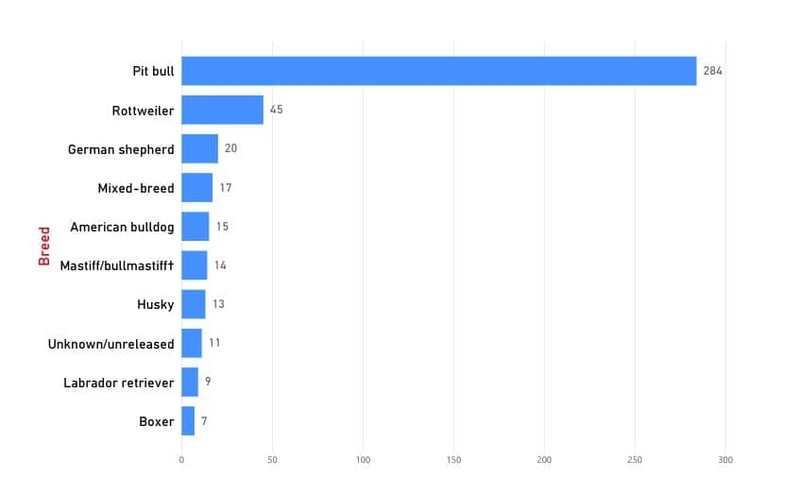 How do Pit Bulls compare to all other dog breeds in terms of fatal attacks on humans? 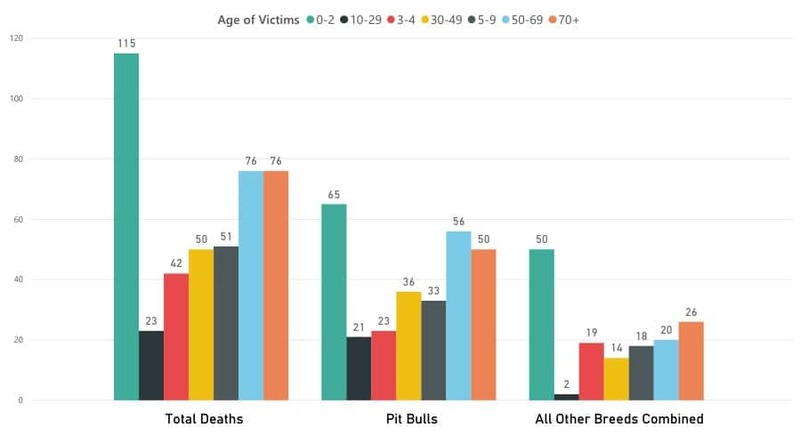 This next chart illustrates the number of deaths due to dog attacks by age group, comparing the data between Pit Bulls and all other breeds combined for the years 2005-2017. We can see how infants (0-2) and older adults (50+) are the highest targeted groups. In the 13-year data set, 54 cases involved a dog killing its primary owner. What Causes a Dog to Attack? the dog feels that person shouldn’t be there, it may attack to protect what it considers its territory. Even domesticated dogs can steadily build behavior that leads to attacks. A dog may at first bark to keep passersby away from its perceived territory. As the dog feels it is successful in keeping intruders away (such as when a jogger runs past), the dog may become bolder and begin to chase passersby. Failure of the owner to correct this behavior may lead the dog to attack passersby. What Do I Do if I Suffer a Dog Bite? To avoid suffering a dog bite, it is best to remain calm around an aggressive dog. Doing so can throw off the dog’s instincts and prevent an attack. However, this may not always be possible. If bitten, you should not pull away, as this can aggravate the injury. If possible, use a free object, like a sweater to distract the dog’s attention and make an escape. Even if you only suffer minor injuries, you may still have a claim. Our team of attorneys can help assess your situation and determine what damages you may recover through compensation. How Long Do I Have to File an Animal Bite Claim in California? According to California law, a person has a maximum of 2 years after the dog bite injury to file their claim. This time frame is known as the Statute of Limitations. This is the same for any other animal attack or personal injury in Los Angeles or anywhere in the state of California. Our Los Angeles Dog Bite Injury Attorneys Can Help You! When a dog bites someone in Los Angeles, the state of California also has laws on “dangerous dogs.” This means that owners must take reasonable steps to remove the risk of future attacks. In some cases, this might mean installing a fence for a yard; in others, it might mean putting an animal to sleep.